How much do we want to exercise, and how much help do we want from machines and electricity? 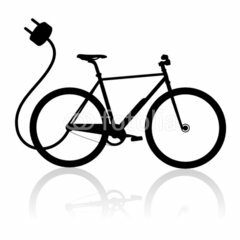 With electric bicycles, or e-bikes, becoming more common, we can begin to wonder whether we are still pedaling bikes or if we are just gradually switching to quieter and slower motorcycles. Not that there is anything wrong with that. 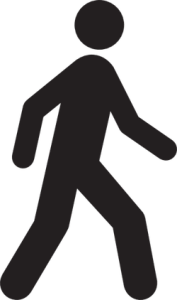 Walking is more efficient than hopping along on one foot. 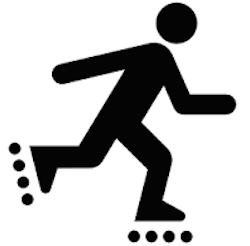 Roller skating is more efficient than walking. 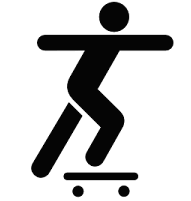 Skateboarding, particularly on a longboard, can be generally more efficient than roller skating for many people as long as they use the board for straight-line transportation rather than tricks. A good kick scooter with real pneumatic tires will usually be more efficient than anything from the skate world, especially if the road has some texture to it, and all of the above are just ways of controlling gravity. The wheels transfer falling into forward motion. But then we introduce the bicycle. No matter what kind of bicycle it is, we now have a machine. Using the leverage of gears, we can amplify our forward motion using less energy and really start to get along more efficiently. 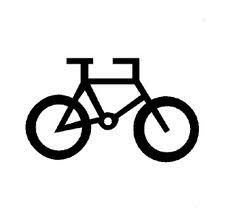 Even if the bike is a single-speed with only one gear, it will take us many times further than walking down a road with the same energy input. But cycling can be very tiring if there is a headwind or if we have to go uphill. At a certain wind speed or gradient, it becomes easier to dismount and walk, pushing the bike along until we get out of the wind or stop climbing the hill. This is where electric bicycles, or e-bikes start to make a lot of sense. The extra weight of the battery and motor may be a lot, particularly for those who can only afford those inefficient and heavy old lead-acid batteries, but the energy we took from the power outlet earlier will get us up the hill and through the headwind with ease. E-bikes are the next big thing, with sales doubling at a regular rate. Many of the good ones are very expensive, and many of the cheap ones are not great, but think of the big hill and you can see why they open up the possibility of cycling to millions of people are who are not so athletic. There are two main types of motor, one is inside the hub of the wheel and one is usually near the center of the frame and connected to the hub with a chain. There are two main types of electrical assist, one is pedal assist where the energy of the pedaling rider is amplified by the motor, and the other is power on demand, from a twist “throttle” or a lever or button. Most e-bikes seem to feature both. Most e-bikes today have the same gears, derailleurs, and shifters as human-powered bicycles, but others have better systems with (clean and dry) belt drives, variable transmissions, shaft drives and other great technological advances. Personally I just have to look at a bike with a chain and gears and it spontaneously breaks and has to be carried to a repair shop. These diabolical chain and gear systems are one of the main reasons I love the simple yet inefficient kick scooter so much. The other reason is the seat. Most bike seats feel to me like I am being eternally hit in the backside with a hammer. I find most normal bikes to be unrideable torture machines, but the e-bike does not have be designed so. It can have a comfy seat, an upright sitting position, no fiddly gear systems, and the motor will compensate for these energy-robbing concessions to comfort. And if you hate pedals and seats even more than I do, you can get an electric scooter and just stand there as you get pushed along. An electric scooter does not bother with pedals and so a seat is only optional. 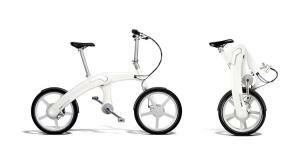 The potential of upscale e-bikes is not lost to the car world. Ford, Volkswagen, Audi and Mercedes-Benz all have flagship e-bikes on offer now. And the bicycle manufacturers always have better and better designs in the works. Towards the lower end of the scale a bike such as the X-Treme Scooter XB-300Li pictured here still has a decent Lithium battery, but costs less than $800. 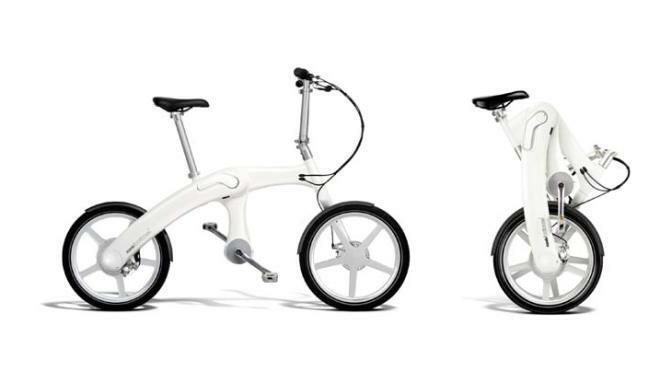 You can clearly see how this has evolved from a regular bicycle. With the unobtrusive rear-hub motor and the battery running down beneath the seat, you may not notice it is electric at all, but it has pedal assist and also a hand throttle. The variety available in electric bikes is very broad and continues to grow as this class of vehicle develops. And it is being fueled by increasing demand. 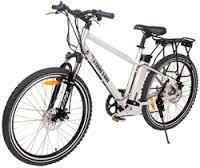 To get a good overview, search for e-bikes on YouTube and see a wide variety being reviewed and tested. You will be busy for hours. As batteries get better and better, there will be more room for electric scooters to make inroads, but today we still need some pedals for a long-range vehicle that won’t become dead weight on the way back home. But for most, the balance between the exercise of pedaling and the free-ride from a battery will be ideal. Jeffrey the Barak prefers a human-powered kick-scooter but he is starting to get tired. This is a very well researched article. Thanks! And to add to it, until I began riding the Oxelo Town 9 kick scooter, I felt that only pneumatic tube kick scooters, starting at 12-inches, were very secure. I certainly wish that the Oxelo brand was sold in the USA. As I currently have a knee problem, the idea of riding an electric scooter is appealing. The good news is that I can still get out and about on the Town 9 using just one leg for support. I have another email address named “foreverkickscooting” and I’m sticking with that mission . . .